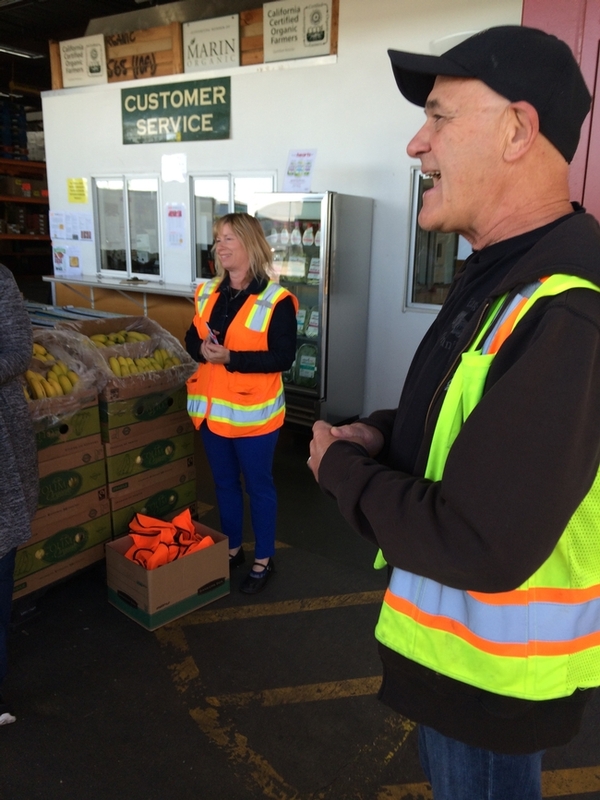 On June 13, the Small Farm Program partnered with UCCE Small Farm Advisor Margaret Lloyd to conduct a tour of wholesale produce markets for Sacramento region farmers. During the bus ride from Woodland to San Francisco, I described the packaging and grading standards that farmers must comply with when selling wholesale. 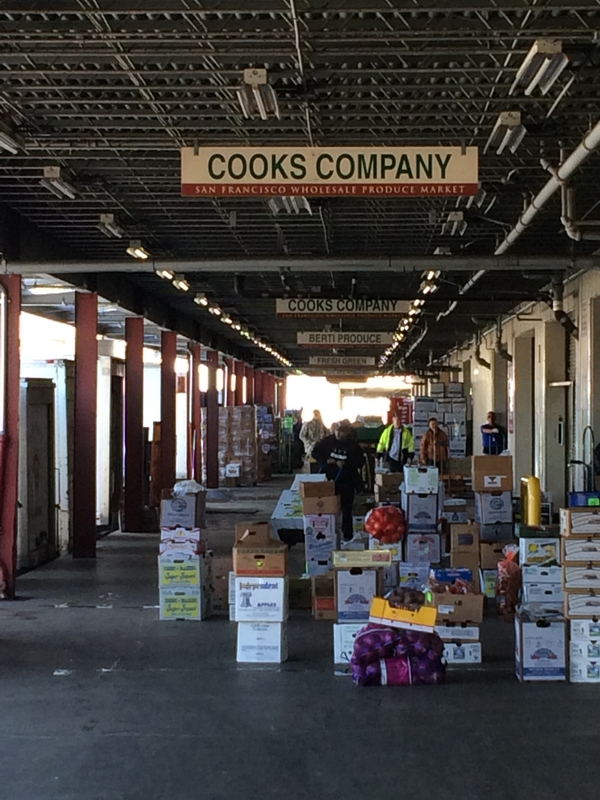 Our tour began with a stop at the San Francisco Wholesale Produce Market, a nonprofit business. It houses 35 produce distributors, wholesalers and an online retailer in busy rows of warehouses. The 18 tour participants gained many insights during our visits with the top management of three businesses in the Market. Cook's Company was established as a wholesaler to Bay Area restaurants in 1985 by chefs Ric Tombari and Elaine Jones Tombari, the generous funders of this tour. Cooks buys from about 300 farms, and delivers to Bay Area restaurants all seven days of the week. Cooks takes same day orders and has no minimum purchase requirements. consider unusual forms of produce, such as Fava bean leaves, Savoy spinach (salad dressing clings well to its bumpy surface), baby turnips and Kennebec (chip) potatoes. We also visited Earl's Organics. Earl Herrick, the founder, opened a single stall at the Market in 1988. Earl's now occupies 30,000 square feet, has its own outbound truck fleet and operates 24/7 as the Market's sole 100% certified organic merchant. The majority of its business is to retailers, juice operations and home delivery ventures. Some of its customers seek produce that is produced using biodynamic practices. Earl is passionate about his relationships with his customers and his suppliers, many of which span 29 years. He firmly stated “Our job is to make our growers rockstars.” When buying from growers, Earl's strives to balance flavor and postharvest shelf life because his business' geographic reach can involve three days between receiving the produce and delivering it to customers. He advised our group that small-scale farmers will get the highest prices for their produce by selling to restaurants. The organic food delivery company, Good Eggs, moved into part of a new $24 million 82,000 warehouse at the Wholesale Produce Market in 2015. It packages and delivers produce, meat, dairy products, meal kits, flowers, condiments and wine from local farms and food businesses that customers buy online. Designed to “bring the farmers market to your door”, it was founded in 2011 and expanded quickly into Los Angeles, New York and New Orleans, but closed all of its operations except for the San Francisco facility in August 2015. Its founder, Rob Spiro, stated that Good Eggs did not realize how complicated it is to create a new category that requires a different approach to supply chains, logistics, and commerce – in order to get food from local producers to consumers' kitchens. During our visit, Produce Category Manager Ben Hartman commented that they had to add imported products because consumers wanted some items year-round. Good Eggs begins receiving deliveries at 4:30AM. It delivers seven days a week; orders received by 1PM can be delivered in the evening. Farmers interested in selling to Good Eggs need to complete an application that can downloaded from its website. Staff will review the application, and will usually follow-up with a farm visit if the farm looks like a good fit. Good Eggs is now sourcing some items that are not certified organic from newer farmers, and it seeks out farmers who grow for flavor more than shelf life. 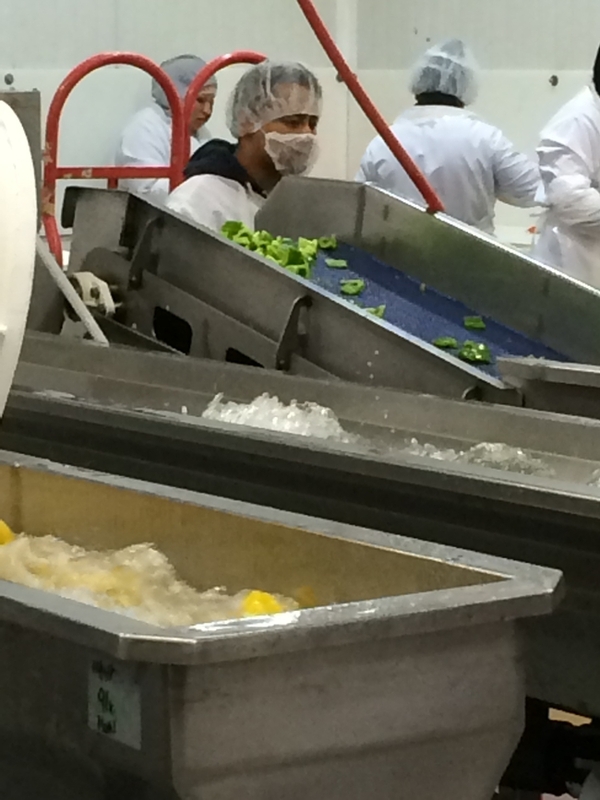 Our final stop was Bay Cities Produce in San Leandro. The family-owned business supplies produce primarily to institutions, foodservice and government organizations in the East and South Bay Area. It carries a full line of fresh, frozen, and custom cut produce (both conventional and organic), including sliced, diced and julienne vegetables. Bay Cities also supplies whole peeled vegetables, salad mixes and cleaned lettuces. Much of the produce is hand cut, which means that customers have transferred their employee safety risk to Bay Cities. After signing in and donning lab coats, hair net and beard nets, we observed many examples of Bay Cities' commitment to cleanliness, sanitation and food-safety during our tour. Vince Del Masso explained that the company spends over $500,000 annually on its food safety program to meet its customers' high food safety requirements. Bay Cities buys most of its produce from California farms. It will provide technical assistance regarding food safety practices to smaller-scale farmers who are interested in becoming its suppliers. What is the Great Veggie Adventure? UC Small Farm Advisor works with grower to push the "Horticultural Envelope"